Community Solar is a new and easy way to purchase solar power to supplement your electric energy needs. Our solar facility is designed with you in mind and its production is shared with numerous other El Paso Electric customers. Power your home or business with locally generated solar energy and help ensure a brighter energy future for generations to come. without any of the issues associated with having solar panels located on your roof. long as you’re a customer. There’s no need to lease or purchase expensive panels. 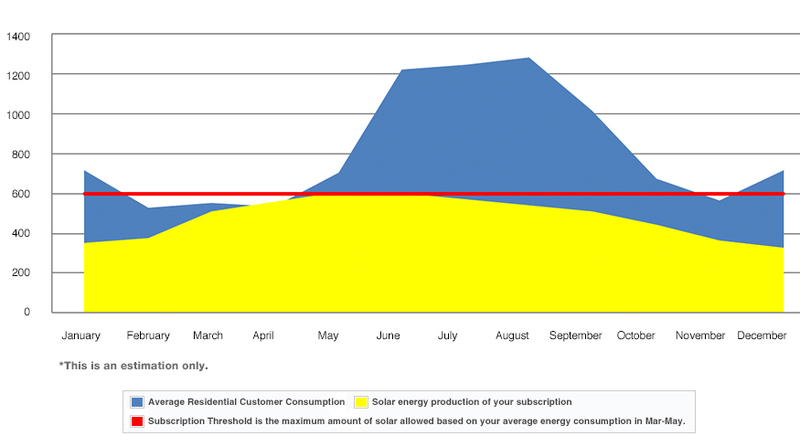 Once you subscribe, you will begin receiving solar energy for a fixed monthly price. It’s that easy! The Community Solar facility uses panels that track the sun for maximum energy production and 25% more efficiency than fixed rooftop panels. as your energy needs grow. The Community Solar Program is the first of its kind in Texas. It will provide local generated renewable, zero emission energy for the next 30 years. Enrolling to Community Solar is easy! Below you’ll find everything you need to know about joining the solar movement towards a bright energy future. 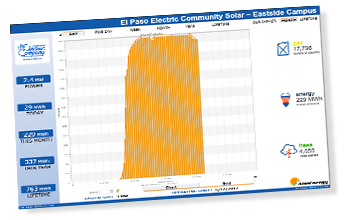 Currently, every El Paso Electric residential and commercial customer in our Texas service territory who doesn’t already have rooftop panels is eligible to subscribe to the Community Solar program, whether you rent, lease or own your home. The Community Solar facility to be used for this program is 3,000 kilowatts (kWs) in size and will be open for subscription on a first-come-first-served basis. Once the program is fully subscribed, any customer who wishes to join will be placed on a waiting list and will be among the first notified by El Paso Electric once their desired portion of kWs is available. Please note that once you have been notified of availability, you must respond within 7 business days or face cancellation of your pending subscription. By subscribing to the program, you are reserving a portion of the energy produced by the Community Solar plant for your home or business. There is a minimum subscription of 1kW with additions available in 0.5 kW increments. The flat charge for the minimum subscription amount is $20.96 per month, which is less than a $1 a day! And the best part is that the charge for your subscription amount will be reduced by EPE system credits based on fuel and generation savings for that particular month. Find more details on the Community Solar Rate section below. Submit an electronic application form using this link. Download your subscription form and send via email to: communitysolar@epelectric.com or mail to the address specified on the form. You’ll be notified via email when El Paso Electric receives your application. All subscription applications will be processed on a first-come-first-served basis. Submitting an application does not guarantee placement in the program and all applications will be subject to space availability. You will be notified by email or phone when El Paso Electric approves your application. You will be enrolled for a 12-month period with an automatic renewal for each successive 12-month period. You may cancel your program subscription with one-month advanced notice. Have questions, or just looking for more details? Find answers here. 1. What if the program is fully subscribed? Answer: Your subscription request will be placed on the waiting list. Once space becomes available, you will be contacted by EPE. Please note that you must reply within 7 business days. If you do not reply within this timeframe, your subscription request will be cancelled. 2. Do I own part of the solar array? Will there be maintenance costs? Answer: No, the solar plant is owned, operated and maintained by El Paso Electric. All associated maintenance costs are included in the Capacity Charge. 3. What happens if it is cloudy or nighttime? Will I have power in my home? Answer: Solar plants do not produce energy at night and have lower energy output during cloudy days. As your energy service provider, EPE will continue ensuring that all of your energy needs are met. Here’s an estimated calculation for the amount of solar needed in an average 1600 to 2500 sq ft home. This will help give you a general idea of the number of kWs you may require, bill credits you might expect and the positive environmental impact your energy choices can make. Now you’re ready to help support Community Solar; a bright new option for providing clean, renewable and sustainable energy for generations to come. Want to see how much energy we capture from the sun? Check out the solar energy produced and total environmental impact of the Community Solar facility. © El Paso Electric - Community Solar. All rights reserved.